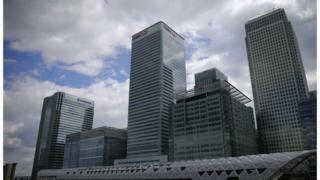 The financial industry could lose £38bn if the UK quits the single market, a report commissioned by a group lobbying on behalf of the City has said. The report, commissioned by TheCityUK, also said up to 75,000 jobs could go. The sector is concerned at the prospect of a so-called "hard Brexit", with the UK leaving the EU single market in order to regain control of immigration. On Sunday, the Prime Minister said "we are not leaving the EU only to give up control of immigration again". Her comments helped to trigger a fall in the pound, which dropped to a 31-year low against the dollar on Tuesday. The report, which was written by management consultancy Oliver Wyman, modelled several possible outcomes for the UK financial services industry after Brexit. In one scenario, it said the UK might retain access to the European Economic Area on similar terms, meaning it would be able to continue trading across the bloc without the need for individual country licences. This would cause less disruption, it said, costing the industry up to 4,000 jobs and £2bn of revenues a year. However, another scenario would see the UK quit the bloc "without any regulatory equivalence". This would cost the industry up to £20bn and 35,000 jobs, it said - although the "knock-on impact" on related business activities could cost a further £18bn and 40,000 jobs. Hector Sants, head of Oliver Wyman and former chief executive of the Financial Services Authority, told the BBC's Today programme: "We are not taking a view on the outcome of the negotiations. "What we have done here is to create a robust and independent database." He said he hoped the research would create a dialogue between the City and government. "We are confident that these are numbers that people can coalesce around and discuss." But Kevin Dowd, an economics professor at Durham University and member of campaign group Economists for Brexit, called the report a "scare story". "The idea we would be held back by leaving the single market makes no sense," he told the BBC. "Most of our financial services business is actually outside the EU, and our share of business with the EU is declining anyway." He added: "Today we're competing with Singapore, New York and Tokyo and so forth, and as far as the City is concerned, those places are the focus." He said the EU was not irrelevant, "just not that important". The Treasury said it was working to ensure companies continued to have access to the single market. "The government has been speaking to the financial services industry to make sure that we understand fully the issues that matter to it as we prepare for negotiations to leave the EU," it said in a statement.